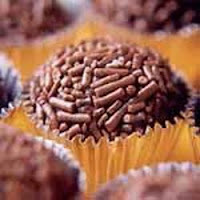 There is a delicious Brazilian sweet that is like a chocolate called brigadeiro! It is named after a Brazilian politician in the 1920s, Brigadeiro Eduardo Gomes. He was an Army brigadier general who first gained notoriety for playing a part in quashing a communist coup in Rio. You can make it in the microwave too, just remember to stir every minute. In a medium saucepan over medium heat, mix the cocoa, butter and condensed milk. Put over low heat and stir constantly with a wooden spoon, until thickened, about 10 minutes. Remove from heat and let rest. Butter your hands and roll the mixture into small balls and roll over the chocolate sprinkles. 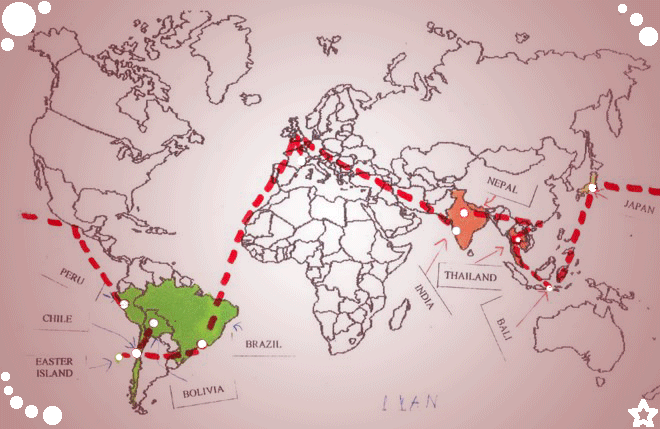 Here is another version of the story of the brigadeiro. "I love brigadeiros, but let me tell you this story might not be right. It is rumoured that this name was created by someone who didn't like Brigadeiro Eduardo Gomes very much... it's about the fact that he had lost one of his testicles during the war (he was shot). Then people during the elections called the candy "brigadeiro" because it doesn't need an egg and "egg" in Portuguese is a slang for "testicle". I don't know where the name "brigadeiro" comefrom, I just know that brigadeiro is one of the most delicious home made deserts I ever tried. I can wait for the moment to cook it again, with you! !